Ok, so they had never really completely disappeared. However, it wasn't so long ago that the horns that once owned the school's hallways were put away and untouched for a almost a year. The number of players had dwindled to nil. That was definitely not going to remain the case as we made a concerted effort to rebuild the proud horn line with the addition of current brass caption instructor Vincent Veloso. 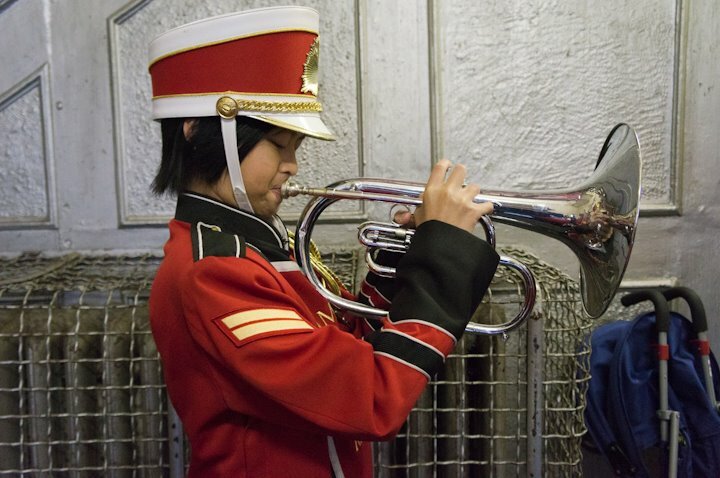 When he joined the team, there weren't even members to teach because the remaining members that were interested in the horn had moved over to other respective lines. They quickly returned to the line with the addition of Vincent. Since then, there has been a tremendous resurgence in the line. We've also decided to refer to them as the brass line, because "brass is class!" We've gone from from three sopranos to now a twelve member horn line -- even including a contra! Some members joined with a bit of experience already, but most had very little or no experience at all. Now, experienced veterans and new rookies are working hard creating a beautiful award winning sound that will honor the legacy and excellence that championship Crimson Kings brass lines over the decades have passed to them. With the recent additions to the horn line, we welcomed Mark Morgan as a co-brass instructor. Building off the solid foundations Vincent established, Mark's DCI and professional classical and jazz performing experience and powerful teaching style have elevated much of the horn line's sound and technique. "My technique is better, and he (Mark) pushes us to improve. His guidance is especially helpful for the younger members to stay focused as they get better." says 2nd year veteran mellophone player and current Brass Captain, Stanley Chow. We are really excited as they work on new songs for the upcoming parade season. "I'm very proud of the hard work and dedication of the brass members and all the members of our corps. They show up to every practice and performance ready and eager to learn and grow as performers, sections, and as a drum corps. I'm really looking forward to the Crimson Kings Drum Corps recording their first CD this year. Mark Morgan is a tremendous musician, teacher and friend. I know that with his help and guidance the brass section will definitely be ready and I know that they will pleasantly surprise many people with their performance." says Vince. In the meantime, feast your ears on this clip below of Simple Gifts during a recent rehearsal. This tune was once only part of the fife line's repertoire, but is now a signature ensemble tune. Brass is indeed class!